As new insights are linked to ideas on the Feature board, it often becomes clear that the insights linked to a given component, feature, or subfeature actually represent several distinct needs. 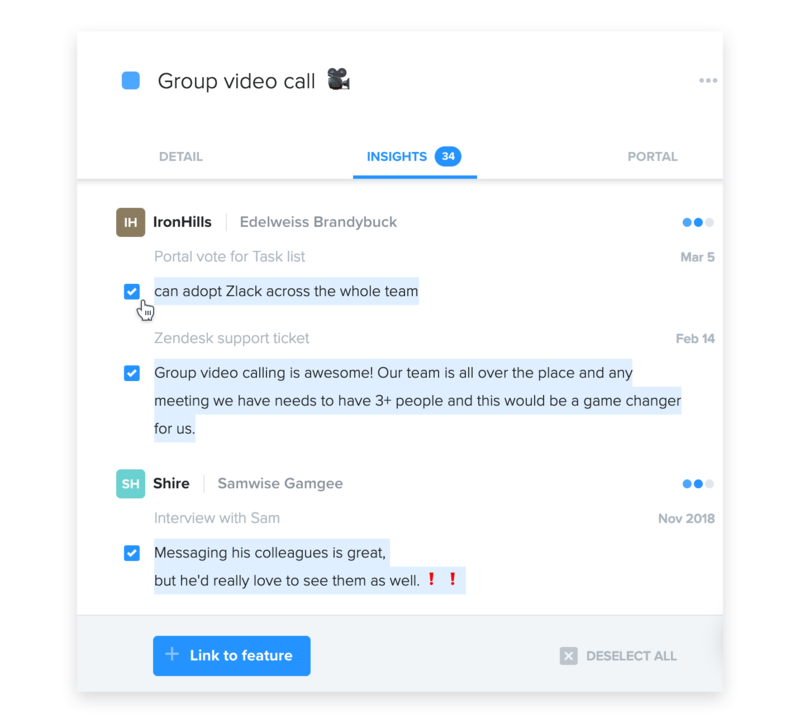 Other times, you might find that, when releasing a new feature, some of the linked insights represent needs that won't be addressed until future iterations. In cases like these it's helpful to quickly re-link many insights from one entity to another – either moving the insights, or copying them to an additional entity. If you'd like to move insights to a brand new component, feature, or subfeature, start by creating that new entity on your Features board. From the existing feature's details pane, under Insights, multi-select the insights you'd like to move. Select + Link to feature. Use the Move insights to feature option to indicate whether the insights will be moved or copied. Select the entity you'd like to move these insights to.